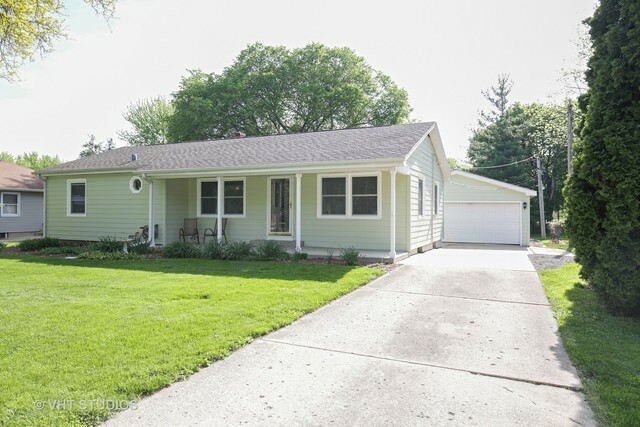 Picture perfect and that is no exaggeration for this 3 bedroom remodeled ranch. Covered front porch leads to the entry.....Living room with cozy corner gas fireplace, well designed kitchen features maples cabinets with plenty of drawers, 2 pull-out pantry cabinets, fully applianced. Bathroom has been updated, White 6-panel doors and trim...beautiful hardwood floors & crown molding throughout most of the home!! Full basement can easily be finished...french doors offer access to large area with some natural light. Laundry area has built-in cabinets & counter. Enjoy summer BBQ on the large patio overlooking the nicely landscaped yard. Nothing to do here but move in & enjoy!!! !